The most common dental health provider that many people visit frequently and accustomed to is the general dentist. The main reason associated with this is because the main role of general dentistry in downtown Los Angeles is to prevent dental diseases from occurring. The greatest number of dental procedures they conduct on the patients are either meant to diagnose a disease or to help in the prevention of a disease. Their main roles are enlightening the patients on the significance of maintaining good oral hygiene which will be reflected in good oral health. It is the responsibility of the general dentist to assist people in the prevention of oral diseases which develop over time due to bad oral hygiene habits. They play a significant role because if the diseases are allowed to develop the individual will be in severe pain when the disease is full blown. This will result in them not being able to go to work or school and spending a hefty sum of money getting treated for something they would have avoided altogether. The general dentists are not restricted to providing their services to a particular segment of the population. General dentists are responsible for providing their care service to all individuals irrespective of their age and gender. They can also be referred to as the family dentist. 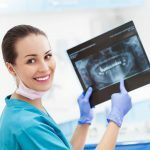 The Smile LA Modern Dentistry has its share of general dentists who handle the basic dentistry issues while the specialists in the various areas of specialization handle the complex cases. The general dentists perform a comprehensive examination of your entire mouth ranging from the teeth to the gums, jaws and roots. They also provide professional teeth cleaning services to remove any particles left during brushing and flossing. They also talk to you about the state of your dental health, what you should do to improve it and what you should avoid. For instance, if one of your teeth is decaying you will need to have some fillings added to it which the general doctor can do but it is in very rare cases. It is speculated that about one hundred and forty-three thousand dentists are registered in the ADA records in North America. About eighty per cent of this figure is in general dentistry. The general dentistry downtown Los Angeles is wide as it is not tied down to one specific area of dentistry. It is concerned with all the dental services that will determine the state of your oral health such as preventive services, restorative services, cosmetic procedures and general oral health concerns. The first qualification is the bachelor’s degree in dentistry from a recognized tertiary institution. They are then referred to as the Doctor of Medicine (DMD) or Doctor of Dental Surgery (DDS) after their name. The only difference between the two titles is the spelling and pronunciation but other than that the training and education given are the same.